it's less than so-called rocket science to put on a cosy hat when popping out on a cold day, because, as every schoolboy and schoolgirl knows, the principal means by which body heat is lost is through the head. or at least, that's been the story up until relatively recently. science, however, always one to whip the carpet from under cleated shoes has debunked this myth. perhaps unsurprisingly, the military is entirely to blame having printed in a survival manual from 1970 that covering your head when cold was highly recommended as 40 to 45 percent of body heat was lost through your head. several years ago, two health researchers from the university of indiana stated this to be utter rubbish, on the basis that we would be every bit as cold if we ventured out minus our bibtights as without a merino hat under the helmet. well, actually they didn't mention cycling at all; i just did that to make what follows slightly more relevant. current thinking is that the original contention by the military was based on a misinterpretation of a vaguely scientific experiment held in the 1950s. those studies concerned volunteers dressed in arctic survival gear subsequently exposed to very cold conditions. because the head was the only part of their bodies left uncovered, it was the part showing the greatest heat loss. you can sort of see where they might have gone wrong. but since the face, head and chest are the most sensitive to changes in temperature, we generally feel as if covering them up does most to prevent heat-loss. in fact, covering one bit of your body is every bit as effective as covering any other part. it's eminently possible that wearing a streamlined dod of polystyrene on your head confers its insulation properties upon that person 'neath its substance, but many of us augment that possibility by wearing a casquette or winter cap, and just maybe a merino winter collar scrunched behind a high jacket or jersey collar. yet on cold, wet and windy days, it's rarely my head that offers the greatest cause for concern. in 1994, i was involved in a serious (to me at least) road traffic incident, one which resulted in two weeks' in hospital and rather a lot of plastic surgery to my right arm. though none of this gives me any grief nowadays, my right hand tends to take a bit longer to heat up than its leftmost counterpart. since i'd rather not be mistaken for a golfer or michael jackson, i prefer to wear a pair of long-fingered gloves when the ambient temperature becomes a bit cooler. these days there are numerous options available for right this minute, with more insulated and waterproof alternatives as winter chunters over the horizon. 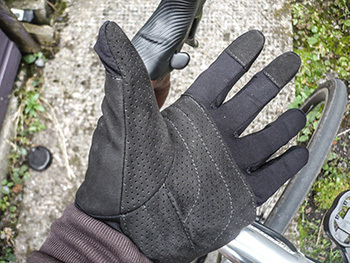 and right this minute, i have an excellent pair of rapha's pro-team gloves in their less startling colour option (black). the major benefit here is the proven technology; ostensibly these gloves share the same fabric as featured on the pro-team softshell, my cheerful companion on last year's festive 500.
this fabric protects the skin from the elements, yet offers perspiration the chance to escape into the weather from which we'd rather be protected. and though i am generally device agnostic (no garmin on the bars), the fingertips allow unfettered swiping of any such surfaces without need of removing the gloves. softshell also has what i might term elastication, allowing a really close fit under jersey or jacket cuffs without an honours degree in dexterity to get them on in the first place. though not quite bespoke, rapha do offer a downloadable sizing diagram to ensure you order the right pair of gloves for you. 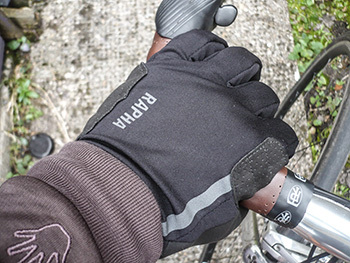 from my point of view, rapha have a press officer who is far more accurate than i'd likely be, so i reviewed an impeccably fitting large-size pair of pro-team softshell gloves which not only performed their prescribed function with aplomb, but were darned comfortable on the bars and hoods with commendably minimal padding. for the visibility impaired, they can also be ordered in a bright coral pink. though everyone around me delights in the indian summer currently being experienced in the hebrides, i personally can't wait until it's time to wear a softshell baselayer under a pro-team softshell, rounded off with these ginger-peachy gloves. perhaps matched with a pair of coral pink pro-team overshoes would be the perfect icing on the cake. it's elemental my dear watson. 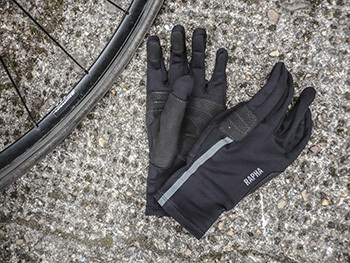 rapha's pro team softshell gloves are available in sizes ranging from xs to xl both in black (reviewed) or coral at a cost of £70.